You are solely responsible for your interactions with other users of the Site. MPG reserves the right, but has no obligation, to monitor disputes between you and other users. By uploading or submitting Community Content to MPG's servers for display on the Site, you represent and warrant that you own all rights in the Content and you agree that the Content will be dedicated to the public domain under the Creative Commons Public Domain Dedication, available at http://creativecommons.org/licenses/publicdomain/. For clarity, the foregoing does not apply to the Content on any external sites to which the Services link. In accordance with the Digital Millennium Copyright Act, all intellectual property (content, photos, etc.) created by MPG and located on the MPG site is copyright protected and is not permitted for use without the expressed written consent of MPG. MPG respects the intellectual property of others. It is MPG's policy to respond to claims of copyright and other intellectual property infringement if the Content is stored and served from MPG's servers. MPG will process and investigate notices of alleged infringement and will take appropriate actions under the Digital Millennium Copyright Act ("DMCA"). Upon receipt of notices complying with the DMCA, MPG may remove or disable access to any material. Notifying MPG of Copyright Infringement: To provide MPG notice of an infringement, you must provide a written communication to the attention of "DMCA Infringement Notification Dept." care of info@MontereyPeninsulaGolfl.com. Please note that we may post your notification, with personally identifiable information redacted, to a clearinghouse such as chillingeffects.org. Please also note that you may be liable for damages (including costs and attorneys' fees) if you materially misrepresent that an activity is infringing your copyright. Providing MPG with Counter-Notification: If we remove or disable access to content in response to an infringement notice, we will make reasonable attempts to contact the owner or administrator of the affected content. If you feel that your material does not constitute infringement, you may provide MPG with a counter notification by written communication to the attention of "DMCA Counter Notification Dept." 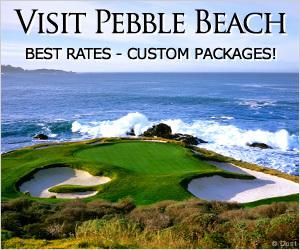 at info@MontereyPeninsulaGolfl.com. Please note that you may be liable for damages (including costs and attorneys' fees) if you materially misrepresent that an activity is not infringing the copyrights of others. If you are uncertain whether an activity constitutes infringement, we recommended seeking advice of an attorney. You acknowledge that MPG has no control over, and no duty to take any action regarding: which users gain access to the Site or use the Services; what effects the Content may have on you; how you may interpret or use the Content; or what actions you may take as a result of having been exposed to the Content. You release MPG from all liability for you having acquired or not acquired Content through the Site or the Services. The Site or Services may contain, or direct you to sites containing, information that some people may find offensive or inappropriate. MPG makes no representations concerning any content contained in or accessed through the Site or Services, and MPG will not be responsible or liable for the accuracy, copyright compliance, legality or decency of material contained in or accessed through the Site or the Services. The Service, Content, and Site are provided on an "as is" basis, without warranties of any kind, either express or implied, including, without limitation, implied warranties of merchantability, fitness for a particular purpose or non-infringement. Some states do not allow limitations on how long an implied warranty lasts, so the above limitations may not apply to you. The Services may provide, or third parties may provide, links to other World Wide Web sites or resources. Because MPG has no control over such sites and resources, you acknowledge and agree that MPG is not responsible for the availability of such external sites or resources, and does not endorse and is not responsible or liable for any Content, advertising, products or other materials on or available from such sites or resources. You further acknowledge and agree that MPG shall not be responsible or liable, directly or indirectly, for any damage or loss caused or alleged to be caused by or in connection with use of or reliance on any such Content, goods or services available on or through any such site or resource. In no event shall MPG or its suppliers be liable under contract, tort, strict liability, negligence or other legal theory (i) with respect to the Site, the Service or any Content for any lost profits or special, indirect, incidental, punitive, or consequential damages of any kind whatsoever, substitute goods or services (however arising), or (ii) for any direct damages. Some states do not allow the exclusion or limitation of incidental or consequential damages, so the above limitations and exclusions may not apply to you.